Swedish studio Avalanche are returning to the series that made them famous, with Just Cause 3 planned for a 2015 release for the PlayStation 4, Xbox One and PC. The game was revealed exclusively by Game Informer as the centerpiece of their December issue. Game Informer were invited to Avalanche’s second studio in New York to try out several hours of the game. Fans of the series can expect improvements across the board with many signature features, such as the grappling hook and parachute, as well as the addition of a wingsuit, Unlike the previous game, Just Cause 2, which was set in Southeast Asia, 3 will take place in the Mediterranean. Game Informer also have a video of the reveal, but it doesn’t contain any video of the game and consists mainly of the developers talking about how awesome they are. 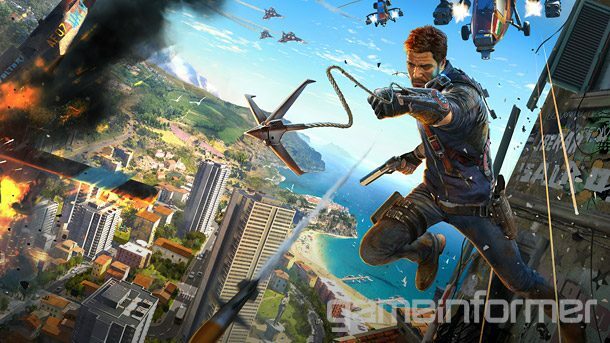 The Just Cause series is known for taking mobility in open world shooters to new heights, with the signature parachute and grappling hook allowing for players to get creative and experiment with causing destruction in all kinds of ways. The previous game in the series, Just Cause 2, was released in 2010 and has sold a robust six million units to date. It still remains a relevant title, particularly on the PC where the modding community has extended the game’s lifespan significantly. In December last year, a fan project designed to introduce multiplayer to the game was picked up by Avalanche, who released it as a free official add-on. More news of Just Cause 3 is sure to follow in the coming months.